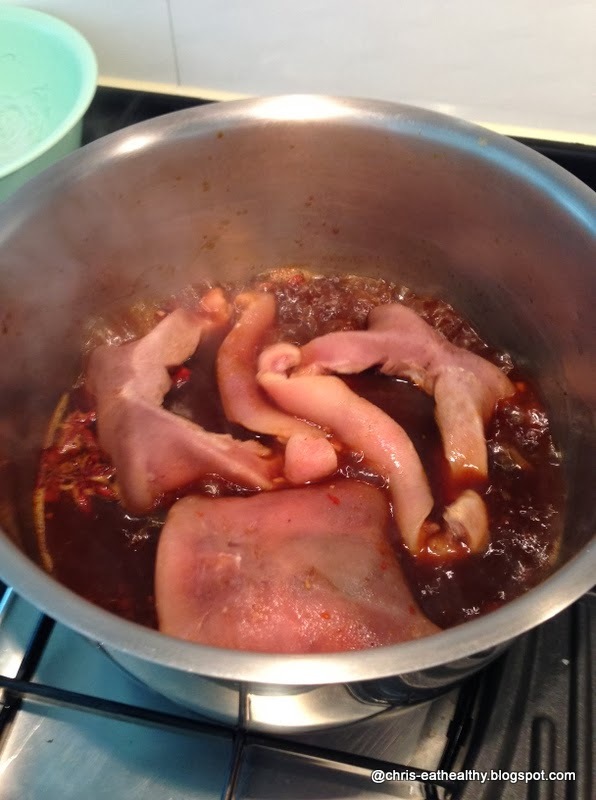 On the last day of the lunar year my friend Christina gave me the idea of making braised pork knuckles and tongues in Chinese marinade (called 鹵水 louh’-sui’) for diner. I thought it was an exciting dish to make to celebrate the arrival of the year of the horse so off I went to buy the ingredients. However, when I arrived at the wet market - at about 2pm - my pork butcher was about to close down his stall. I could not help but think of my 1st Chinese New Year in Hong Kong when I could not find any vegetables after 4pm! I learnt after this incident not to wait for the last day to buy food needed for the first 3 days of the Lunar New Year. But this year it was different: I wanted to make an extra dish so it was not a big deal if I could not find what I was looking for. The kind man apologized and pointed at 3 small pork snouts in a plastic bowl on a table behind him. 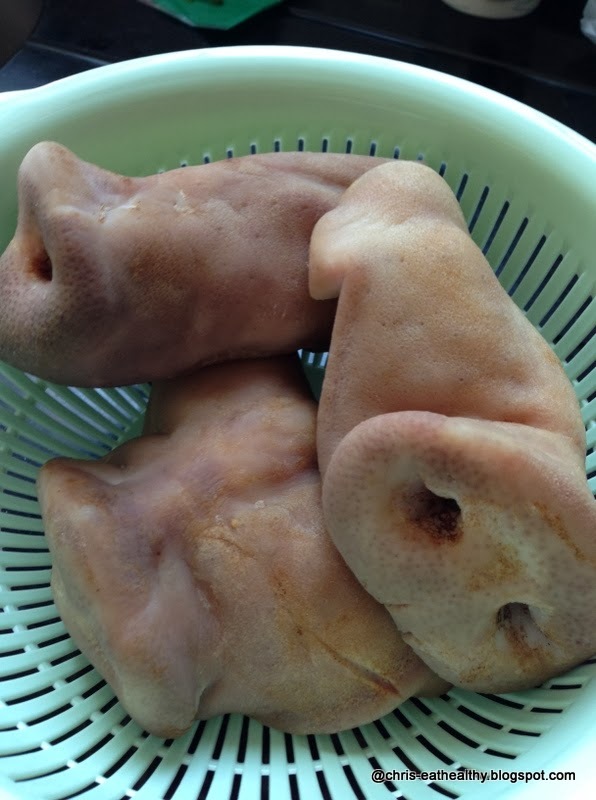 I asked myself: “Pig’s snout?” The pork butcher explained: “You can cook it in the same way as pork knuckle. It is very tender if well cooked”. I listened to him and went home to prepare my dinner. I know it is easy to find ready-made bottles of louh’-sui’ (Chinese marinade) at supermarkets but I wanted to make it myself so I googled and found a few recipes. Note: What is Chinese marinade? This is a stock which is made with spices and sauces that is used for poaching or braising meats, or tofu (bean-curd) or even hard-boiled eggs. In Chinese it is called 鹵水 louh’-sui’. Add the pig snouts, ginger, spring onions, and garlic in the pot. Bring to a boil. Reduce the heat and simmer for one hour. 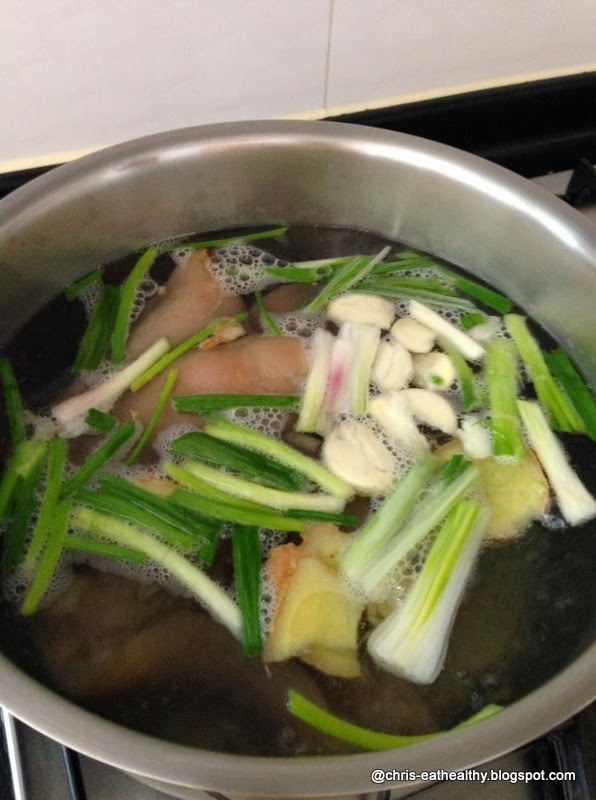 Drain the pig snouts and discard the garlic, scallions, ginger, and the water. In a medium-sized casserole, mix the rice wine, soy sauces, hoisin sauce, chili bean sauce, sugar, star anise, cinnamon, pepper, salt, and water. Bring to a simmer and add the cooked pig snouts. Cover and reduce the heat. Simmer for 1-1/2 hours, or until the meat is tender. Transfer to a dish with the sauce and garnish with chopped spring onion. The meat was very tender and tasted great. I put the leftover sauce (stock) in the fridge and will use it in the coming days to braise meat. I also put the leftover snout in another box in the fridge. When I opened the box yesterday I noticed the sauce had solidified and turned into gelatin, which means I made a good stock! It is also a great cold appetizer. Although I already ate pig’s snout in France before I think it was the first time I had it in Hong Kong and for sure the first time I cooked it myself. 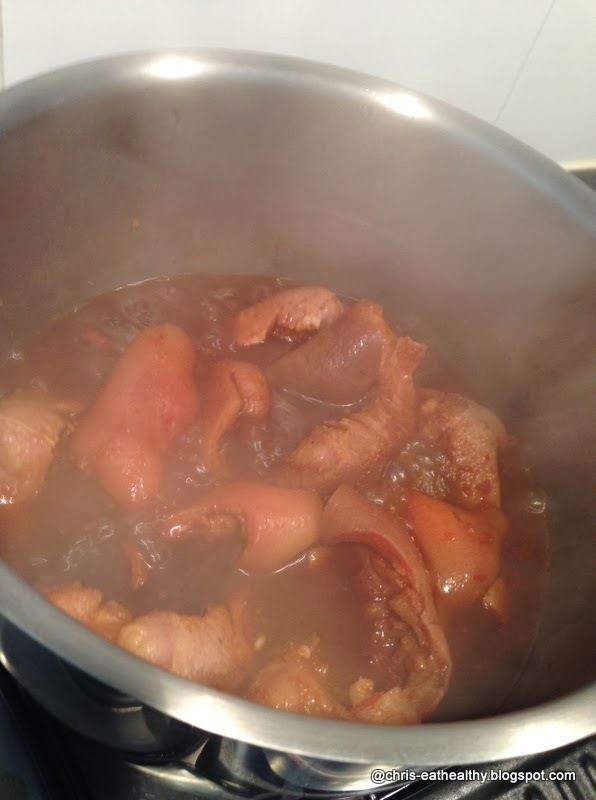 French people have many ways of cooking pig snout: served in salad style with mustard vinaigrette (most pork butchers are selling house-made “salade de museau” or pig’s snout salad), braised in red wine sauce, etc. Although I know that snout isn’t to everyone’s taste I never imagined that my husband would not even want to try it. I was surprised as he likes pig’s tail and cold sliced pig’s ear (Chiu-Chow style). Anyway, I will make it again for people who like it and before that I wish you all a Happy, Prosperous and Healthy Year of the Horse!